After rummaging through old photos, I wonder why I didn’t post here this flyer fluttering against the breeze. Perhaps the pic was discarded for lacking clarity. But three years later, I value the dreamy soft focus and lighting set against background blur. I shot the Featured Image on April 11, 2015 at 10:40 a.m. PDT, using Fujifilm X100T; Classic Chrome Film simulation applied in camera and ND filter turned on. Vitals: f/2, ISO 200, 1/300 sec, 23mm. Portrait is near 100-percent crop. 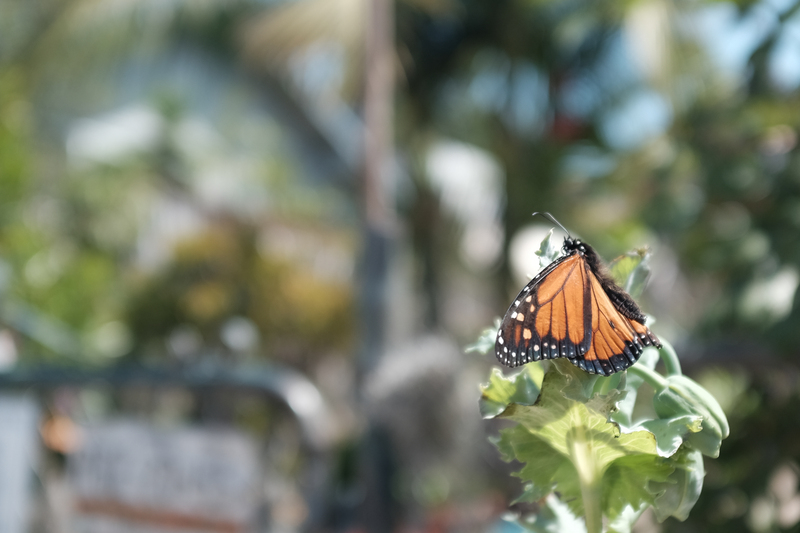 I spotted the Monarch outside a designated Wildlife Habitat that my family calls the Butterfly House, which is along Maryland Ave., in San Diego’s University Heights neighborhood. I have seen the caterpillars there, too.